Yeah. That’s right, I’m talking to you. You bloggers who are reading this instead of posting something. How am I supposed to procrastinate effectively without my daily reading material? No, no apologies needed, you just go post something, then come back. I’ll wait. Okay, good. Like I said, I’ve got to have something to read – I get bored when I’m shirkin’ my workin’! On to the post, then. Today was a good day, in terms of mail. I got a package of paperbacks that I bought on ebay (fiiinally ;)), and I got a package from my grandmother. She sent a lovely bedtime book for Max, and a quilt for Charlie. 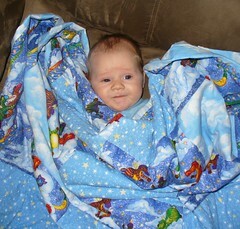 I think she is taking it upon herself to single-handedly provide baby quilts for the entire clan (she made mine! I still have it. It’s covered in hot-air ballooning teddy bears). It reminded me of a thought I had around the time when Charlie was born – a crafty woman’s child will never go cold. Apparently the same goes for grandchildren, great-grandchildren, and so on, lo – even until the fifth generation’s toes are nice and toasty. Or something like that. Followed by a Max who (although you can’t really see it here) was hamming shamelessly for the camera. Dragons and castles and bears, oh my! Yummy. 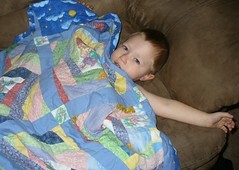 Anyway, it’s a good thing Grandma is providing quilts for these kids because…I don’t really quilt. She taught me how when I was a teenager – I even have a few in various stages of progress – but I just don’t do it. I think the problem is the lack of a proper workstation. The last time I worked on a quilt was actually before Max was born – it turns out that taking the sewing machine out, setting it up, working with it and then putting it away before the kids get up is a terribly inefficient use of crafting time. That may no longer be a problem in the new house – the nursery has a lovely walk-in closet with a full-sized window, and there’s plenty of room in it for my sewing table. Did you hear me? The nursery has a walk-in closet with a window. No lie. That closet is actually the reason that Charlie will be sleeping in that room and not the one Max is getting. Everyone knows that “nursery” is just another name for “mama’s room that she puts the baby to sleep in.” When he’s old enough for a big-boy bed, he’ll be moving in with Max whether or not there’s another baby yet, since I think that sharing rooms is a valuable part of being a sibling. Besides, I want my workroom. Even if my workroom is only a walk-in closet, it’s bigger than the one I have now (and by that, I mean a corner of the couch). Besides, it’s got a view. Anyway, I hope you posted something, or I’m going to have to go pack more. Or – heaven help me – clean something. Beautiful quilts! What an awesome gift for your children. I have two quilts, one made by my great-grandmother and another made by my grandma. They are my most treasured possessions. And a walk-in closet with a WINDOW?!?!?! You hit the jackpot! What great pictures of the kids! The quilt is beautiful-blanket too. Cute quilts! My mom’s a big quilter and tried to get me hooked by giving me a sewing machine. But try sewing when the only table you have in the house is a card table–ha ha! I thought the thing would bounce right off onto me from the vibrations! Yes definately make them share rooms. We grew up with three boys in one room and us three girls in another. Good times. Good times. Please. Don’t do anything crazy. Like clean. Just step away from the mop.